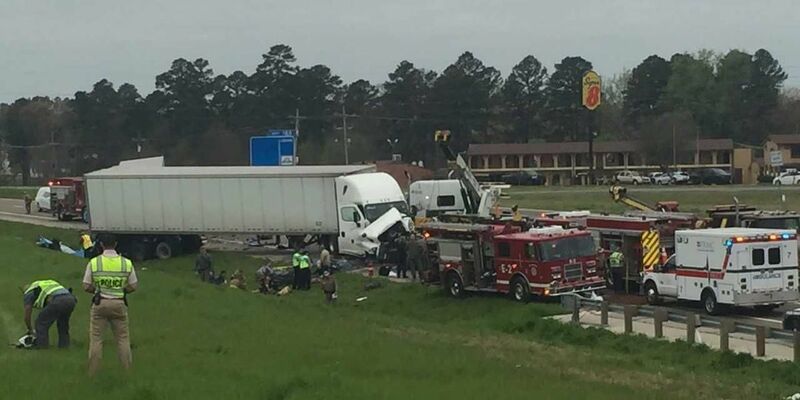 MOUNT PLEASANT, TX (KLTV) - A multi-vehicle wreck on I-30 in East Texas Friday took the lives of five people, including several children. Witnesses to the accident, in Mount Pleasant area, say they've never experienced anything like this. They say they heard a loud, thundering boom, then the sharp sound of metal colliding. "It was a very loud thunderous bang, and I was probably 1000 or 1,500 yards away in a place of business with glass," witness Ken Blalock says. "I literally felt the ground shake, it felt like thunder in the earth," witness Jennifer Moore says. It was a sound these bystanders say they will never forget. It was the sound of tons and tons of metal clashing together to produce a horrible result. "It was pretty traumatic, it was devastating, I have never seen anything like that," Blalock says. Ken Blalock was at his father's BBQ restaurant, Blalock BBQ, just yards away from the crash. He says he was one of the first witnesses on scene. "At first glance, I had no idea that there was a vehicle underneath the cab of the white truck until under close inspection I could see that that could happen, so I didn't go any closer, because it looked pretty bad and I didn't want to…you know…," Blalock says. Jennifer Moore was walking her dog as, she says, the ground shook underneath her and then just minutes later, she could hear the sound of the blades of a helicopter. "I knew it wasn't good because about 5 minutes later I heard the air flight, then I knew it was bad," Moore says. Some bystanders parked on the side of the interstate to watch law enforcement clean up the damage. It took about 4 ½ hours. Initially, eastbound traffic was completely shut down. After several hours, one lane was opened to allow traffic to pass.